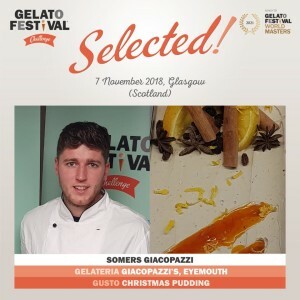 Gelato Festival World Masters – Somers wins the Glasgow Heat! Somers Giacopazzi travelled to New Concept Beyond Catering Equipment in Glasgow on Wednesday 7th November to take part in the Gelato Festival Challenge, organised by Carpigiani. Somers created a new version of our bestselling Christmas Pudding Ice Cream that was picked as the winning product based on taste, presentation and technique! This is truly an honour as Somers was competing against some of the biggest producers in Scotland! Needless to say, we’re all feeling super proud of Junior Gelato’s achievement, which of course, he would class as just all in a days work..! Please note that we are open from 9am for coffees with Breakfast served from 10am to Midday. We start frying at Midday every day and serve takeaway food right up until our closing times, with last orders for dining in our restaurant 30 minutes before we close.